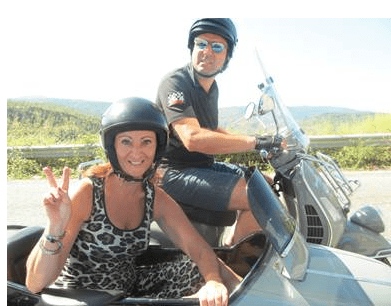 Viviana’s brother and her on a Vespa sidecar trip last summer crossing Calabria coast-to-coast. Are you Italian or of Italian descent? Do you know how to speak Italian? 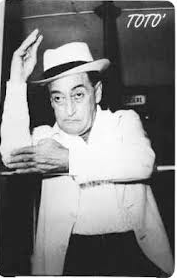 Some Italian-Americans can still speak it fluently while others might have lost the language of their “nonni” (grandparents). To learn to speak this great language, check out Mondo Italiano which was created by Viviana Altieri. She created Mondo Italiano with her desire of combining her experience in International Business Development and her love for foreign languages. Originally from Rome, Italy, Viviana first came to Pittsburgh in 1993 right after college on a $100 bet that she made with two Duquesne University students. More on that below! Since moving to Pittsburgh, Viviana has worked for a variety of different corporations including PNC Bank, UPMC, Primo Magazine, Freemarkets, and Compunetix, making frequent international trips to Europe. In conjunction with her corporate career, she also taught Italian part-time at the University of Pittsburgh, CCAC, and other language institutions. Viviana’s family still resides in Rome; although her mom and dad are originally from Puglia. Viviana has one sister, Ilaria, and one brother, Piero, and four beautiful nephews. Viviana recently took some time responding to some of our questions via email. We wanted to get to know more about Mondo Italiano, her Italian heritage and favorite traditions, as well as some tips on learning to speak Italian. CP: Tell us the story of how you ended up in Pittsburgh. Viviana: In the summer of 1993, I attended Moscow State University and I met and became good friends with a Duquesne University student. Once the semester was over, she returned to Pittsburgh and I returned to Rome. A couple of months later, that same friend, another student, and a professor came to Rome for a conference. Of course, I wanted to show them some of the finest Italian hospitality! Eventually, I weighed my options and decided that if I was going to get a 6-month visa, I would come to the U.S. and make it an experience that would also go on my resume. Otherwise, I would have stayed with plan A and go to Ireland. Well, one of two students was instrumental in securing an internship for me at the Pittsburgh Council for International Visitors (now called Global Pittsburgh) and the U.S. Embassy gave me my 6-month VISA. So on Dec. 17th 1993, I first landed at the Pittsburgh International Airport. I still remember the first time that we drove through and come out of the Fort Pitt Tunnel, heading towards Lawrenceville—that “ WOW” factor that you experience at night when the lights are on and the river has a life of its own. I must admit, after 20 years, that WOW factor has not gone away! So what happened to the bet? Unfortunately, I have never seen the money (the other student moved away) but I can honestly say that I have met many people worth their weight in gold—friends, mentors, and people who have believed in me and unveiled my full potential as a professional but also as a person. CP: Describe Mondo Italiano for our readers. Viviana: I wanted to really put my skills and my passions together and create a school, a center, a community that would bring students of the Italian language and anyone loving this beautiful culture together. So, Mondo Italiano opened its doors—and as I like to define it—as a boutique language service provider which currently offers classes from beginners to advances students (our famous Italian Boot Camp) to adults and children. You can participate in our Sunday conversation hour called Italiano-Espresso where you can practice your Italian while drinking your espresso. We also offer cooking demonstrations, travel presentations, movie night, wine tasting, scopa and bocce tournaments, and attend the Opera as a group on a regular basis. We represent Italy at the Pittsburgh Folk Festival and do so much more. I have to say that working with children has given me the biggest rewards. Seeing them uttering their first words in Italian and then, few weeks later, being in a play or a few years later, acing their Italian test and being admitted in very prestigious universities—priceless! Italian is indeed our flagship language but we also provide a variety of different services that involve many other languages. We do work with several corporate projects here and overseas as well, the local refugee community and other international groups. Additionally, we get involved in a variety of special initiatives with schools, non-profit organizations, and fundraisers. 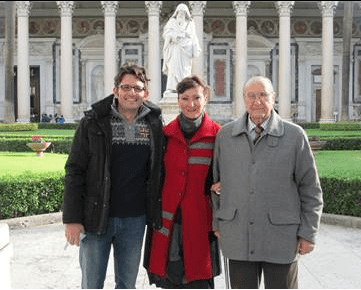 Viviana’s dad, her husband and her outside Saint Paul Basilicate in Rome. CP: What do you enjoy most about what you do? Viviana: Basically owing my own business means that I can choose any 12-hour work day, 365 days of the year—but, I am very passionate about what I do and I am 100% dedicated to provide outstanding programs and services to anyone with whom we work, at all times, whether it is a new student or a new translation project or a new cross-cultural training program for a big corporation. To simply put it, I am creatively restless and restlessly creative. CP: Where do you currently live and what do you enjoy most about the city? Viviana: I have recently moved East of Pittsburgh (Swissvale) and I am loving it. I’m so close to the school (the Wilkins School Community Center), Frick Park, great eateries, and Regent Square Movie theater. Prior to that, I had always lived in the South Hills in Mt. Lebanon and I still go there twice a week for business. When I first came to Pittsburgh in 1993, the blizzard, the cultural and the language difference, made the adjustment period a little challenging. Not because of the city but because of not knowing many people, or sharing the same past, books music, and movies. I thought that the Steelers were steel workers and expressions such as “See you later. Talk to you later,”—were a bit confusing as I would not seeing those people later or even getting their calls later! As a foreigner, initially you take things literally! Viviana: My family is originally from Puglia but my paternal grandmother is from Avellino. 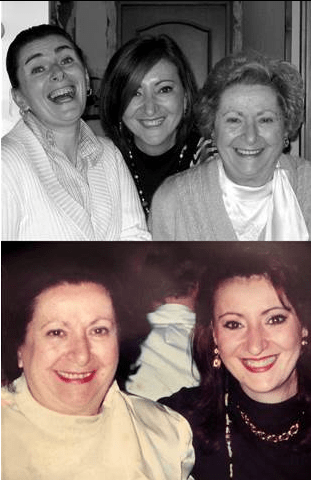 She was a great cook and I remember always going to visit my grandparents for the holidays in Foggia. She would have all the typical sweets ready but tucked in a closet. My grandfather worked for a bank so he would always keep track of what was there and how many of them. My brother and I would wake up in the middle of the night and “steal” some of our favorites from this closet. We thought we wouldn’t get caught especially since no one was saying anything the day after. But one day as we were reaching out for our nth chocolate covered orange peel (typical of that region), my grandfather pulled out his notebook and told everyone what we had been up to for the last four nights with a gesture Toto-like (the famous Neapolitan actor) that became since legendary in our family (see photo). When I first arrived here, I made a lot of American friends. 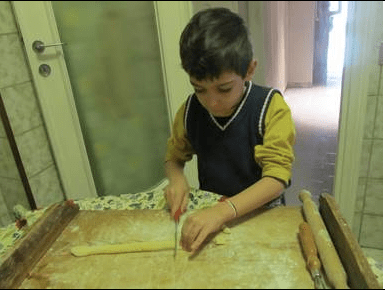 It wasn’t until much later that I started to meet people from Italian descent and that is when I started to develop a true fascination for their stories, their festivals and traditions. Being straight from Italy (and not having had any close relatives who have emigrated to the U.S.), all of what I was discovering “being Italian here” was all new to me. Our history books don’t have the details of the struggles or the discrimination that people went through. They just treated it as dry fact and forget the human aspect. What I truly enjoy now is to dig deeper when I discover a new local tradition. I try to find out the how, when, where this tradition came to exist here, who brought it, and from what region of Italy it comes from. The last one was the Doll dance at the San Rocco Festival in Aliquippa or even more recently, the history of a lost past, the famous Larimer Avenue. I drive to so many places, trying to spot any fragment of “Italianess” and what life could have been there many years ago. I hear that Larimer Avenue was considered the Little Italy of Pittsburgh and a very vibrant community. So anyone with stories, memories, pictures—please do get in touch with me. Viviana: Well, I am fond of our Christmas sweets, in particular “strufoli” (tiny fried honey balls). My paternal grandmother taught my mom how to make them. She would pull out a wooden board that we still have and use. When the wooden board would come out, you know what you were in for something special! Mom always perfectly managed to be a nurturing mother, a wonderful pediatrician, a good cook, and the glue of the family. My mom, knowing that I would go home for Christmas, would make enough plates of strufoli for the holidays for family and guests, and a special plate just for me. I could “scarf it down” in a matter of minutes. This year, as mom is no longer with us, it was on my sister and me to preserve this tradition. So when I flew back home, we put the little kids in the kitchen in a production line and we all worked to put our love for these tasty honey balls and our love for mom in them so that we would be sure to have “un vero..buon natale” (a truly “Merry Christmas”). Another favorite is “il dolce die dei morti” which is prepared for Nov. 1st and is a mix of dry ingredients (cooked barley, chocolate, candied fruits, nuts, cinnamon and pomegranate, dressed with vin cotto). Viviana: It is a way of living that is in my DNA. I can’t separate from it; sometimes I am not even aware of it but it is always with me. It is a gift that I hope I can share with as many people as possible. Our rich past of great inventors, historians, musician, artists, and our rich present of great researchers, great young aritists, great young musicians, simply great brain (grandi cervelli) continue to make me proud of my country as well as any other country that has welcomed Italians and allowed Italians have been able to become successful and make something out of themselves.. with hard work and determination. The city of Pittsburgh has a strong Italian community from the past and a very numerous Italian community of the present that comes or has come here from Italy in the last 10 to 15 years to work for companies such as UPMC, Ansaldo, Bayer and are making Pittsburgh their new “casa” (home). CP: What separates your Italian language program from other programs? How do you stand out? “I have used Mondo Italiano services for the last 10 years. I have two small children that I wanted to learn Italian. They always came up with creative (and effective) teaching techniques. My children are now teenagers and they have become experts in the culture and the language.. We have now gone to Italy together several times and THEY are the ones that have taking charge of getting us to places, choosing quaint little (authentic) restaurants and finding out the best shopping streets to get the latest Italian fashion at reasonable prices. I have to thank Mondo Italiano for going way beyond a typical curriculum that you would expect from a private language school and really dive in into the culture. My husband, an Executive at a local high-tech company, has also had the need for an interpreter for customers coming from Italy to during a tour of their plant and other company activities. The interpreter that Mondo Italiano sent was extremely professional and knowledgeable. My kids are now off to college, and my husband and I have decided to go to Italy by ourselves for our 20th wedding anniversary. We are taking a crash course in Italian and “ a tutti coloro che vogliono imparare l’italiano” (To anyone that wants to learn Italian), Mondo Italiano should be your choice. CP: What advice or tips do you have for people who want to learn how to speak Italian? Viviana: First and foremost, they should enjoy their learning experience. Maybe have an Italian movie night at your house….or start answering the phone with “Pronto”…or go to La Prima Espresso on a Saturday morning and hang out with Sam Patti or the guys that play scopa there all the time! Rome was not built in a day therefore people should give themselves time but mainly take themselves less seriously (especially the adult learners). In our class, we use a variety of different techniques that make the learning fun. We also use puppets (therefore the learner is no longer in the spotlight, the puppet is), role plays and every semester, we manage to build a “community”, like an extended “famiglia” of like minded individuals what will then get together even after those 10 weeks of class for a glass of vino, a movie, an exhibit or a road trip. We create bonds based on a true passion for Italy that do last “a vita” (for life) and that is our true mission. Viviana: I guess having had 15+ years in business development for major corporations, I came to Mondo Italiano with a solid business foundation. I have been pretty fortunate to have great mentors and role models that I can still turn to for advice. I am extremely demanding of myself. I have inherited a strong work ethic from my parents (both doctors in times where they would still respond to house calls in the middle of the night any day of the year! ), along with an unstoppable thirst for knowledge. As a result, when I or any of our employees deliver a program or a project, it has always to be top-notch. And that is how we earn our customer’s trust, over and over again. Word of mouth has also done wonders for us along with a truly genuine positive attitude and a true interest in people, as our #1 priority. CP: What else would you like our readers to know about you or Mondo Italiano? Viviana: Our classes are starting in May, so, come and join us for an amazing journey into the Italian language and culture. We will gladly offer 20% of registration if you mention Ciao Pittsburgh and receive a 20% off registration. On the Mondo Italiano website, you’ll also find a variety of events that we organize throughout the city as well as a virtual marketplace with lots of Italian gifts. Don’t speak Italian but love the country? No problem, we will be happy to have you among us! We are coming to the 10th year anniversary of our social group and we will have a big party! You are all invited! …And if you see me around, please stop me and say “CIAO”. 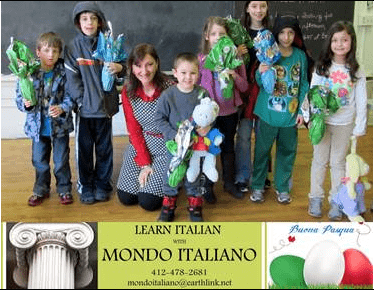 To register for a class or to learn more visit Mondo Italiano at: http://home.earthlink.net/~mondoitaliano/id9.html call us: (412) 478 2681 or email us: mondoitaliano@earthlink.net..